Due to significant environmental concerns associated with industrial livestock farming, it is vital to accelerate the development of sustainable food production methods. Cellular agriculture may offer a more efficient production paradigm by using cell culture, as opposed to whole animals, to generate foods like meats, eggs, and dairy products. However, the cost-effective scale-up of cellular agriculture systems requires addressing key constraints in core research areas: (1) cell sources, (2) growth media, (3) scaffolding biomaterials, and (4) bioreactor design. Here we summarize work in the area of insect cell cultures as a promising avenue to address some of these needs. We also review current applications of insect cell culture and tissue engineering, provide an overview of insect myogenesis and discuss various properties of insect cells that indicate suitability for use in food production systems. Compared to mammalian or avian cultures, invertebrate cell cultures require fewer resources and are more resilient to changes in environmental conditions, as they can thrive in a wide range of temperature, pH and osmolarity conditions. Alterations necessary for large-scale production are relatively simple to achieve with insect cells, including immortalization, serum-free media adaptation and suspension culture. Additional benefits include ease of transfection, nutrient density, and relevance to seafood organisms. To advance insect-based tissue engineering for food purposes, it is necessary to develop methods to regulate the differentiation of insect cells into relevant cell types, characterize cell interactions with biomaterials with an eye toward 3D culture, design supportive bioreactor systems and quantify nutritional profiles of cultured biomass. The Intergovernmental Panel on Climate Change of the United Nations released a recent report stating that in order to prevent global warming from increasing above 1.5°C, a goal that could prevent the severity of natural disasters correlated with a 2.0°C increase, anthropogenic greenhouse gas (GHG) emissions need to decrease 45% by 2030 (Intergovernmental Panel on Climate Change, 2018). In 2013, the Food and Agriculture Organization (FAO) of the United Nations assessed animal agriculture to be responsible for 14.5% of anthropogenic GHG emissions (Gerber et al., 2013). The FAO identified the principle sources of these emissions to be feed crop production (45%), enteric fermentation (39%) and manure management (10%) (Gerber et al., 2013). Mitigation strategies include optimizing current food systems (e.g., improving breeding, animal health, feed) and developing new products with lower environmental footprints. Researchers and entrepreneurs have proposed numerous alternative food systems to supplant conventional meat, eggs and dairy; including transgenic animals (Thornton, 2010), plant-based analogs (Smetana et al., 2015), and insect farming (van Huis and Oonincx, 2017). In addition to combating climate change, the projected benefits of these novel approaches include improved food safety, nutrition and animal welfare. However, each of these approaches has significant drawbacks. Although plant-based meat analogs are relatively affordable and sales in the United States are rising each year (Plant Based Foods Association, 2018), the products face a number of limitations: (1) primary consumers are vegetarians/vegans, not omnivores, (2) for analogs that aim to fully emulate animal products, the slightest discrepancies in taste/texture/behavior can produce an “uncanny valley” effect (Hoek et al., 2011), (3) plant products generate waste unless all material is utilized and some crops (e.g., almonds, walnuts, rice) have water footprints equivalent to meat and poultry (Mekonnen and Hoekstra, 2011). Transgenic animals are also being pursued, however, they often only address a single issue—such as reduced methane production or disease resistance (Clark and Whitelaw, 2003; Bruce et al., 2013). Entomophagy is another proposed solution to combat the detrimental effects of intensive animal farming. The suggested environmental benefits of insect farming include lower greenhouse gas emissions, lower water requirement, lower space requirement (e.g., vertical farming), rapid growth and reproduction rate, and high food conversion efficiency (largely due to differences in edible weight fraction, crickets and beef are 80 and 40% edible, respectively) (van Huis et al., 2013; Tabassum-Abbasi, 2016). Cricket flour is gaining some traction in the United States due to proposed benefits of both sustainability and nutrition, as many insect species are shown to be high in protein, healthy fats and minerals (Rumpold and Schlüter, 2013; Mason et al., 2018). However, due to food neophobia it will likely be a challenge to achieve mainstream acceptance for insect consumption in Western cultures, despite the prevalence of this practice in other parts of the world (Hartmann et al., 2015; Verbeke, 2015). Furthermore, due to innate taste and texture differences, foods from whole insects may not satisfy meat and poultry cravings (Caparros Megido et al., 2016). To reduce the consequences associated with resource-intensive animal agriculture and overcome the challenges of existing alternatives, it is important to continue identifying and pursuing new food system innovations with potential for transformative impact. Cellular agriculture is the emerging industry and field of study associated with producing agricultural commodities (e.g., meat, dairy, leather) via cells as opposed to whole animals. Such products have the potential to address industry issues and consumer needs not met by other alternative foods. By removing the animal from the production process, advocates of the technology suggest that meat produced via cellular agriculture (i.e., cultured meat) will be safer, more humane and better for the environment relative to conventional products produced through animal farming (Bhat et al., 2015). For example, a 2014 life cycle assessment estimated that compared to farmed meat, cultured meat could require up to 45% less energy, 96% lower greenhouse gas emissions, 99% lower land use, and 96% less water (Tuomisto and Teixeira de Mattos, 2011). A separate study concluded that while resource and land inputs could be less for cultured meat than for conventional meat, energy requirements could be higher (Mattick et al., 2015). The abridged process for cultured meat production involves (1) procuring cells, (2) proliferating the cells in bioreactors, (3) adhering the cells to scaffold systems, and (4) promoting differentiation into muscle and fat tissues (Arshad et al., 2017). Cultured meat technology is currently in the early stages of research and development. Cells from various species, primarily bovine, porcine and avian, have been targeted for cultured meat production (Genovese et al., 2017; Verbruggen et al., 2018). However, cells obtained from less obvious species may prove useful in overcoming the ongoing technical challenges restricting cellular agriculture advancement and scale-up, including high media costs and necessity of adherent culture conditions for many cell types. In particular, insect cells have several qualities that suggest feasibility of large-scale production such as ambient growth conditions, low media requirements and straightforward adaptation to suspension and serum-free culture (Neermann and Wagner, 1996; Donaldson and Shuler, 1998; Lynn, 2001; Ikonomou et al., 2003; Mitsuhashi and Goodwin, 2018). Pursuing research and development for insect cell-based foods may be a powerful means of generating new sustainable food products and accelerating the field of cellular agriculture. Early projects involving insect cell culture included monitoring the growth and development of spermatozoa from the gypsy moth, and examining the progression of wilt disease with insect hemocytes (Glaser and Chapman, 1912; Goldschmidt and Wilhelm, 1915). In 1962, the first continuous insect cell lines were established, setting the stage for insect cell culture to become a staple of entomological research (Grace, 1962). These developments and initial uses of insect cell culture were followed in the rest of the twentieth century by the establishment and application of hundreds of insect cell lines from a variety of orders, which have been reviewed elsewhere (Lynn, 2007; Smagghe et al., 2009). Compared to mammalian cells, insect cells are capable of tolerating a broad range of environmental conditions (Akiyama et al., 2013) (see Table 1). The ability to proliferate and maintain physiological function in variable pH, temperature, and oxygen conditions makes insect cell culture an attractive system for food production. Robustness across environmental variables allows different culture conditions to be tuned for maximum efficiency (Reuveny et al., 1993). Insect cells can be grown at scale at room temperature; conserving the energy input generally required for incubating mammalian cells. Many insect cell lines can also be grown without supplementing carbon dioxide, further simplifying culture systems and increasing economic viability relative to mammalian cells (Irons et al., 2018). Table 1. Comparison of insect and mammalian cell growth conditions and methods of culture. Lactic acid buildup due to cellular metabolism is problematic in mammalian cell cultures, as the accumulation of lactic acid and the associated drop in pH reduce proliferation (Konakovsky et al., 2016). Insect metabolic pathways mitigate this issue by circumventing the production of lactate from glucose (Ferrance et al., 1993; Neermann and Wagner, 1996). These properties enable maintenance of high rates of proliferation that are beneficial for mass production of cells. Furthermore, total glucose consumption has been reported to be lower in insect cells than mammalian cells, indicating potential for cost savings through reduced media usage (Neermann and Wagner, 1996). In addition to their utility in insect physiology and disease research, insect cell culture has emerged as a powerful tool for biomanufacturing. By coupling scalable cell culture with engineered baculovirus expression vector (BEV) systems, insect cells can be leveraged to generate large quantities of viral or protein products (Ikonomou et al., 2003). Current applications of this technology include production of bio-insecticides, therapeutics, vaccines, and recombinant proteins. 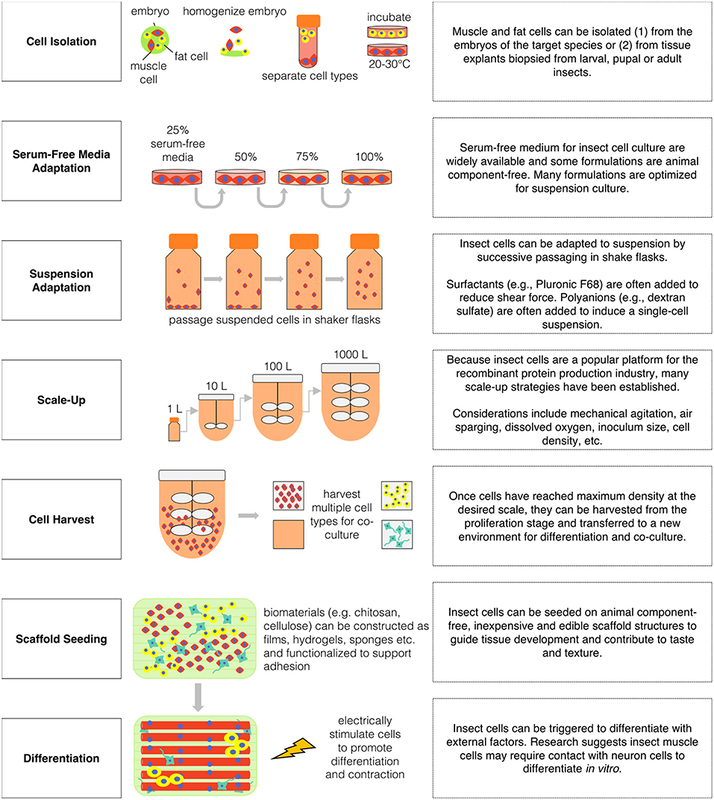 Sf9, Sf21, and High Five are three of the most commonly used cell lines for industrial biomanufacturing applications, and are favored over mammalian cell lines for their robustness and production efficiency (Drugmand et al., 2012). Glybera and Flublok are examples of human therapeutics produced from insect cell culture and BEV technology (van Oers et al., 2015). Insect muscle culture is prominent in the field of soft robotics. Researchers have constructed small scale robots or “bio-bots” from both mammalian and invertebrate biomass (Ricotti et al., 2017). Insect-derived bio-bots may be superior to bio-bots constructed from mammalian tissues or cells because insect tissue is tolerant to a wide range of environmental conditions. For example, Ctenoplusia agnate dorsal vessel tissues (DVT) were found to contract in vitro at 5–35°C (Akiyama et al., 2008c) and Manduca sexta muscle cells maintain contractions at 15–37°C and at pH values ranging from 5.5 to 7.5 (Baryshyan et al., 2014). Furthermore, insect muscle tissue can contract without external stimuli or media refreshment for extended periods (18, 30, 90, and 250 days have been reported for various species) (Akiyama et al., 2008a,b, 2009). Although the majority of experiments use excised DVT for force generation, select studies have used muscle cell cultures dissociated from either DVT or embryos (Akiyama et al., 2008b; Shimizu et al., 2010; Baryshyan et al., 2014). Because of differences in the size and measurement methods between systems it is difficult to compare the forces generated by cultured muscles but portions of the insect DVT produce between 4.7 and 20 μN (Akiyama et al., 2009, 2012a) and similarly sized constructs from neonatal rat cardiomyocytes produce 1.7 μN (Horiguchi et al., 2009). Cultured M. sexta muscle cells can generate approximately 2 kPa of stress (Baryshyan et al., 2014) which is similar to that estimated for cultured rat myocytes (Dennis et al., 2001). When directly comparing contraction capacity via index of movement (IOM) of C2C12s and primary M. sexta myotubes, M. sexta myotubes contracted throughout the entire measured timeframe (23 days) while C2C12s stopped contracting after day 9 (day 0 is defined as the day contractions began). Moreover, IOM measurements were typically higher values for M. sexta myotubes than the C2C12s (Baryshyan et al., 2012). Bioactuator devices have increased in complexity over time, from substrate-free tissue contractions and micro-pillar arrays to autonomous micro-robots, atmospheric-operable micro-tweezers and pumps (Akiyama et al., 2008b,c, 2012a,b, 2013; Tanaka et al., 2017). Insight gained from biomanufacturing and bioactuator research can be translated to insect muscle cultured for food applications. For instance, efforts to improve the efficiency and cost-effectiveness of recombinant protein production through insect cell-based biomanufacturing have led to the development of bioreactor systems and low-cost media formulations relevant to insect cellular agriculture. Furthermore, bioactuator technology may be applicable since cultured muscle may require contractile stimulation to increase differentiation, affect protein expression and impact texture (Datar and Betti, 2010). Uesugi et al. (2016) used insect-based bioactuator devices derived from final stage larva of Thysanoplusia intermixta to compare the in vitro effects of tensile, thermal, electrical and chemical stimuli. They found that tensile, thermal, and electrical stimuli could regulate contractile force, while thermal and chemical stimuli could regulate contractile frequency. A separate study concluded that chemical stimuli via crustacean cardioactive peptide could increase contractions of C. agnata DVT by 5.6-fold and may be superior to electrical and thermal methods which can be detrimental to the cells (Akiyama et al., 2008a). Yet another study successfully stimulated Drosophila melanogaster DVT via optogenetic engineering and light pulses of 2 Hz, suggesting optogenetics as promising low-cost and non-invasive control strategy (Suzumura et al., 2011). To pursue the development of insect cell-based food products, it is essential to understand the growth and the development of relevant cell types (primarily muscle and fat) in their endogenous context. D. melanogaster and M. sexta are two of the most frequently studied insects for myogenesis research, and muscle formation is reported to be similar in the two organisms (Duch et al., 2000; Schnorrer et al., 2010; Ayme-Southgate et al., 2015). Here, we review the processes involved in embryonic and adult myogenesis in D. melanogaster (see Figure 2). As various cell types and species of insects are explored for cellular agriculture applications, additional research will be necessary to characterize the unique biological pathways responsible for in vivo cell development and in vitro culture. In D. melanogaster, somatic larval muscle is derived from groups of mesodermal cells expressing high levels of the transcription factors Twist and Sloppy-Paired. Within each group, one cell becomes a myogenic progenitor cell and the rest become fusion-competent myoblasts. The myogenic progenitor cells give rise to muscle founder cells, each of which fuses with 4–25 of the surrounding fusion-competent myoblasts to form larval muscle. Myogenic progenitor cells can also generate quiescent adult muscle precursor cells (Gunage et al., 2017). Fusion is facilitated through the membrane adhesion proteins Dumbfounded (on founder cells) and Sticks-and-Stones (on fusion-competent myoblasts) (Schnorrer and Dickson, 2004). Many of the muscles formed during embryogenesis are remodeled during metamorphosis, triggered by dynamic hormone levels (Baryshyan et al., 2012). During adult muscle development in D. melanogaster, previously quiescent adult muscle precursor cells are activated and proliferate, either de novo (dorsal ventral flight and abdominal muscles) or guided by preexisting larval muscle (dorsal longitudinal flight muscles). Like in embryonic myogenesis, the majority of adult muscle precursor cells differentiate into fusion-competent cells and a subgroup become founder cells. The myofibers form a myotendinous junction with tendon cells before differentiating into contractile muscles. Adult muscle precursor-derived muscle satellite cells have also been reported to respond to injury in D. melanogaster, characterized by expression of the transcription factor Zfh1 (Gunage et al., 2017). Similar mechanisms are reported in other insect species. In M. sexta, the dorsal longitudinal flight muscles also develop from the fusion of myoblasts with preexisting larval muscle and motorneuronal innervation is reported to be important for correct formation of the adult muscle fibers (Duch et al., 2000). In both species, muscle development is influenced by ecdysteroid levels (Weeks and Truman, 1986; Truman et al., 1994). In 2001, insect cell culture was proposed as a production system for human food (Verkerk et al., 2007). However, little progress on the subject has been made in the past 17 years. The recent surge in public attention and innovation in the field of cellular agriculture marks an opportune moment to revisit insect cells as a nutrition source. As the technical hurdles constraining mammalian cell-sourced cultured meat development have come into focus, the potential utility of insect cells has become increasingly apparent. Many of the same characteristics that make insect cells suitable for use in biomanufacturing and soft robotics also make them promising candidates for efficient, scalable food production. Obtaining a stable and scalable source of insect muscle and fat cells is an important challenge in the effort to engineer insect tissues for food. 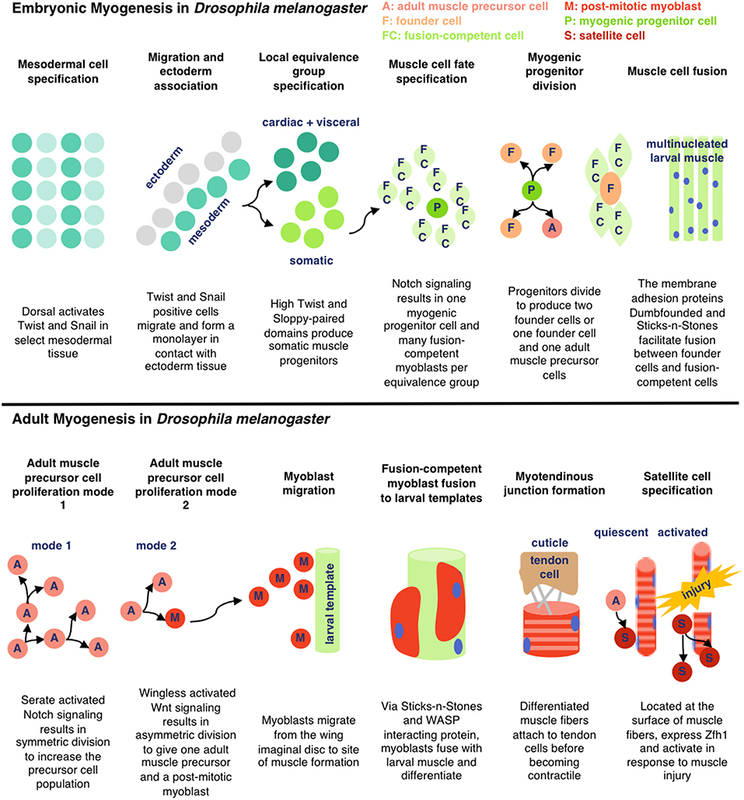 Despite the emergence of insect cell culture as an important biotechnology, minimal attention has been given to the establishment of muscle cell lines. However, there are previous reports of primary and immortalized myoblasts from D. melanogaster, and of contractile myotubes from M. sexta (Bernstein et al., 1978; Baryshyan et al., 2012; Dequéant et al., 2015). These protocols are valuable in providing a means of investigating relevant aspects of insect muscle cell biology in vitro. However, for production purposes, stable lines of muscle progenitor cells capable of extended proliferation and eventual differentiation is important (Kadim et al., 2015). Insect muscle cells have been isolated and cultured from D. melanogaster and M. sexta embryos and from M. sexta stage 2 pupae (Luedeman and Levine, 1996; Simcox et al., 2008; Baryshyan et al., 2012). For D. melanogaster embryonic isolation—embryos laid overnight at 17°C are sterilized with 50% bleach and rinsed with a detergent solution before homogenization with Schneider's medium supplemented with 10% fetal bovine serum. Embryonic-cell containing supernatant is centrifuged and rinsed before plating roughly 100 μL of cell pellet into three T-25 culture flasks. Cells are incubated at 22°C and media is refreshed every other week (Simcox et al., 2008). For M. sexta embryonic isolation −19 to 22 h old embryos are collected and sterilized with 25% bleach and rinsed with EGTA-media before homogenization. The supernatant is centrifuged and plated at 5 embryos per cm2 in a L15/Grace's-based media with 12% fetal bovine serum, EGTA and other supplements. After 2 h, non-adherent cells are removed, the plates are refreshed with EGTA-free and cells are incubated at 26°C (Baryshyan et al., 2012). For adult M. sexta isolations, pupae are sterilized and the leg muscles are dissected and digested with collagenase-dispase. The tissue is centrifuged and rinsed with L15/Grace's-based serum-free media before plating at one leg per culture dish (Luedeman and Levine, 1996). Both primary embryonic and pupae myoblasts are able to proliferate and differentiate compared to genetically immortalized adult muscle precursor cells from D. melanogaster which exhibit strong proliferation but limited differentiation capacity (Dequéant et al., 2015; Rubio et al., 2019). Limited differentiation in immortalized insect muscle cells may be due to the lack of supporting cell types present in primary cultures as there is some evidence insect myoblasts require direct contact with neurons to fully mature (Luedeman and Levine, 1996; Gunage et al., 2017). More research is needed to determine if the relationship between insect age and proliferation capacity is similar to trends in mammalian cell types—in which cell multiplication decreases with an increase in animal age (Schultz and Lipton, 1982). The ability to control proliferation and differentiation of cultured muscle cells is also important for large-scale production. While the hormonal pathways involved in insect muscle development are not as well elucidated as those in humans or other animal species, valuable progress has been made in this area. Specifically, muscle remodeling has been shown to be under control of steroid hormones known as ecdysteroids (Hegstrom and Truman, 1996). In M. sexta, myoblast proliferation is stimulated by moderate levels of 20-hydroxyecdysone, and inhibited by adjustment of the concentration beyond a critical threshold (Champlin et al., 1999). High levels of ecdysteroid can be used to induce proliferative arrest and differentiation, an effect that is inhibited by the presence of methoprene, a juvenile hormone analog (Champlin et al., 1999). These hormonal controls of the differentiation pathway can be exploited to regulate cell development during production. In cellular agriculture, fat is important for both taste and nutrition. Many insect species contain high amounts of essential fats like omega-3 and omega-6 fatty acid (van Huis et al., 2013). Apart from lipids, insect fat body tissue also contains carbohydrates and proteins (Hoshizaki and Chapman, 2012). To produce nutritious and palatable food products, it will be important to culture insect fat tissue alongside muscle. Insect fat body tissue is analogous to adipose and liver tissue in vertebrates in that fat body cells both store and metabolize energy and nutrients in vivo (Hoshizaki and Chapman, 2012). Fat body cells are also beneficial for in vitro culture of other insect cells. Nutrient storage and release by fat cells may increase muscle cell survival and contraction in vitro for month-long durations without media refreshment (Baryshyan et al., 2012). Similarly, fat body cell conditioned media may promote in vitro embryonic development (Ferkovich et al., 1991). Fat body was one of the first insect tissue types to be cultured in vitro within the study of protein synthesis (Raikhel et al., 1997). Fat body cells synthesize important proteins including juvenile hormone binding protein, vitellogenin and yolk protein precursors (Nowock et al., 1975; Wyatt, 1988). Multiple publications have detailed insect fat body cell isolation procedures. Most protocols use late-stage larval animals and sterilize the surface of the animal with ethanol or sodium hypochlorite (Mitsuhashi, 1981; Philippe, 1982). Fat body tissue is excised from the abdomen and minced in either buffer solution or culture media (Nowock et al., 1975; Mitsuhashi and Inoue, 1988; Kishimoto et al., 1999; Lynn, 2001). Most protocols cultured the explants without digesting the tissue although one study used Dispase I to dissociate the cells (Kishimoto et al., 1999). A wide variety of culture media formulations have been used for fat body cell culture including basal media with or without antibiotics and with or without fetal bovine serum (Mitsuhashi, 1981; Philippe, 1982; Mitsuhashi and Inoue, 1988; Kishimoto et al., 1999). Most protocols incubated the cells around 25–27°C and refreshed media once every 1–2 weeks (Mitsuhashi, 1981, 1984; Philippe, 1982; Mitsuhashi and Inoue, 1988). Passaging can often be performed via gentle mechanical disruption contrary to the enzymatic methods commonly used with vertebrate cells (Lynn, 2002). While most cell lines were cultured as adherent, one study established a cell line from S. seriatopunctata that grew in suspension (Mitsuhashi, 1984). Fat body tissue cultures often contain heterogeneous cell types (see Table 2), the morphologies of which have been described in the literature (Mitsuhashi, 1984; Wyatt, 1988; Kishimoto et al., 1999). Cells isolated from fat body tissue were reported to initially grow slowly but can be established as continuous lines (see Table 3). For instance, a fat body cell line isolated from M. brassicae was reported to be first passaged after 26 days but subsequently 100 passages were performed over a 9-month period (Mitsuhashi, 1981). Doubling times for fat body cell lines ranged from 48-72 h (Mitsuhashi, 1981, 1983, 1984). Fat body cells can be stored temporarily at 5°C or for years at −70°C in 10% glycerol (Mitsuhashi, 1981). Table 2. Cell types within insect fat body tissue. Table 3. Continuous cell lines established from insect fat body tissue. A key benefit of insect cells compared to mammalian cells is ease of adaptation to serum-free media. The use of animal-derived serum in culture media for cellular agriculture is problematic due to high costs, batch-to-batch variability, and ethical concerns related to animal welfare. Fortunately, insect cells are frequently adaptable to serum-free media, and a wide variety of suitable formulations are commercially available or reproducible from published reports (Chan and Reid, 2016). Scale up of insect cell culture for industrial applications has fueled successful efforts to develop serum-free media at a low price point, indicating promise for economic viability of insect cell-based food production (Donaldson and Shuler, 1998). However, further innovation in this area is needed, as most media options continue to rely on chemically undefined components that limit precise optimization and analysis (Agathos et al., 1990; Mitsuhashi and Goodwin, 2018). Some early studies detail “in-house” serum-free media formulations for insect cell cultures. For example, Donaldson and Shuler (1998) developed a low-cost serum-free media formulation (IPL-41 basal medium, soy protein hydrolysate, yeastolate, lipid-sterol emulsion, and Pluronic F-68) which supported growth rates of the High Five cell line equivalent to the commercial media formulation, Ex-Cell 405. To date, three-dimensional insect tissue constructs have primarily been developed to generate bioactuators. Primary muscle cultures from M. sexta (Baryshyan et al., 2014) or dorsal vessel explants from C. agnate (Akiyama et al., 2012a, 2013) have been integrated with polydimethylsiloxane (PDMS) molds to generate mechanical systems. PDMS is used as a morphological guide to encourage self-assembly of primary cultures and to provide a flexible substrate during muscle contractions. Scaffolds for cultured meat require disparate design requirements. For example, a scaffold intended for ingestion should be free from animal components, inexpensive, abundant and edible. In addition, similar to scaffolds for biomedical applications, the structure should have a large surface area for cell adhesion and mimic the mechanical properties of target tissues. To develop cultured insect tissues for human consumption, scaffolding materials will need to be explored, characterized, and optimized with these features in mind. Mushroom chitosan may be a promising biomaterial for insect tissue scaffolds. It meets the above design requirements and chitosan is well-documented in the literature for scaffold fabrication in the biomedical engineering field (Croisier and Jérôme, 2013). Specifically, chitosan can be constructed into sponges with aligned pores that mimic the extracellular matrix of skeletal muscle tissue (Jana et al., 2013). Chitosan may be specifically relevant to insect and crustacean tissue engineering as the material is derived from chitin, a principle component of invertebrate exoskeleton (it can also be isolated from fungi) (Pochanavanich and Suntornsuk, 2002; Moussian et al., 2005). In insect cuticle, chitin is present in the form of nanofibril bundles (2–6 nm diameter, 500 nm length) (Muzzarelli, 2011). Although crustacean-derived chitosan is more commonly utilized than mushroom-derived chitosan, fungal chitosan could present additional benefits (besides being animal-free) including more specific molecular weight and absence of allergens (Croisier and Jérôme, 2013). Furthermore, mushroom chitosan is “generally recognized as safe” (GRAS) by the United States Food and Drug Administration. Chinova Bioworks produces chitosan as a preservative for the food and beverage industry as the material is proposed to be effective against a range of microorganisms, as well as digestible as a healthy dietary fiber (Daniells, 2018). Aside from chitosan, other biomaterials commonly used for medical applications of tissue engineering may be suitable for cellular agriculture purposes (see Table 4). However, few materials have been evaluated specifically for insect-based tissue engineering, and it is therefore important to investigate fundamental properties such as the capacity of materials to support insect muscle and fat cell adhesion, survival, proliferation and differentiation. Table 4. Biomaterials potentially suitable for cellular agriculture scaffold applications. While most cell culture systems require adhesion, many insect cell lines can be readily adapted to suspension culture in spinner flasks or bioreactors (Palomares et al., 2015). The surface-to-volume ratio of stationary monolayer cultures decreases as scale increases, making such systems problematic for mass production. Thus, the capacity to grow in suspension culture is useful for cost-effective, high-volume cell generation (Wu et al., 1989; Agathos, 1991). Protocols have been established for the adaptation of insect cells lines to suspension conditions, and previous efforts have been successful in establishing systems suitable for scalable culture (Murhammer and Goochee, 1988; Gioria et al., 2006). Alongside traditional batch bioreactors, a variety of more complex bioreactor systems have been evaluated for insect cell culture applications for the recombinant protein production industry including: airlift, semi-continuous, rotating wall, and perfusion reactors (Ikonomou et al., 2003). While simple bioreactor schemes could be useful for cell proliferation phases, perfusion reactors could be utilized for the muscle differentiation phase during which the cells would be adhered to a surface as multinucleated myofibers. Efficient transfection systems have been developed for introducing recombinant DNA into insect cells (Roest et al., 2016; Mori et al., 2017). While this technology has primarily been employed for industrial production of recombinant proteins, it also shows promise for application in the production of insect cells as food (Ikonomou et al., 2003; Drugmand et al., 2012). By transfecting specific genes into insect muscle cells, it will be possible to create insect cell-based food products with optimized nutritional qualities, taste, and texture. Genes could also be introduced to expand proliferative capacity of primary cultures, reduce the dependence of cells on expensive growth factors, or incorporate clinically relevant proteins for development of therapeutic foods. Advances in insect cell culture and tissue engineering can potentially be translated to in vitro methods for invertebrate species that are more readily consumed in Western cultures such as lobster, crab and shrimp due to evolutionary proximity of insects and crustaceans. Although hundreds of insect cell lines have been developed, no continuous crustacean cell lines have been established to date (Claydon, 2009). However, primary crustacean cell culture methods are commonly adapted from methods developed for insect cells. For example, the basal culture media for crustacean cultures typically consists Grace's Insect Medium (Toullec, 1999; Li and Shields, 2007). One study detailed the relevance of insect methods to the culture of prawn cells; noting knowledge of animal body fluid composition, patience with slow initial culture growth and low temperature incubation as important factors for success (Lynn, 1999). Pursuing the continued application of insect cell technology for the development of crustacean culture systems may help accelerate the arrival of cultured crustacean food products. Edible insects are often lauded for having equal or superior nutrient profiles relative to conventional meat or poultry products, as they are a dense source of protein, monounsaturated and polyunsaturated fats, fiber, and minerals (see Figure 1) (Verkerk et al., 2007; van Huis et al., 2013; Latunde-Dada et al., 2016). However, additional research is necessary to determine how the nutrition of cultured tissues compares to values obtained from whole organisms. A 2013 review by the FAO reports that whole insects could provide greater amounts of micronutrients than isolated portions of the insect (van Huis et al., 2013), indicating a heterogenous nutrient distribution. By growing different insect tissues in vitro, it will be possible to prioritize use of nutritious tissues (e.g., muscle, fat) while avoiding those that lack advantageous nutrient profiles. Bioavailability is another relevant concern from a nutritional perspective, as bioavailability of nutrients can vary between organisms and is not always proportional to nutrient concentration. Fortunately, bioavailability of nutrients from cultured cells and tissues can be evaluated via in vitro assays with the use of human intestinal cell cultures (e.g., Caco-2) (Maznah, 1999; Latunde-Dada et al., 2016). Figure 1. Nutrient profile comparison of edible insects and popular mammalian meats (Rumpold and Schlüter, 2013; Nutrient Data Laboratory, 2018). Nutrients are quantified in terms of percent of daily recommended intake (DRI) in a 100 g sample (dry basis). Protein, fat and fiber DRI values are specifically for men <50 years old and weighing 75 kg (Institute of Medicine, 2005) and mineral DRI values were selected as the greatest value from the respective ranges (Food Agriculture Organization/World Health Organization, 2004). The development of a sustainable, healthy, and ethical global food supply is a high priority as the world's population expands. Feeding nine billion people by the year 2050 will require highly efficient food production systems that make responsible use of natural resources and eliminate the harmful effects of high-density animal farming. Cellular agriculture is a rapidly growing field of innovation through which such a food system can be achieved without requiring consumer behavior change. The application of insect cell culture in cellular agriculture shows promise as a means of overcoming technical restraints and achieving high volume, low-input, and nutritious food production. The robustness of established techniques for culturing insect cells and their ease of immortalization, transfection, high-density proliferation, and serum-free, and suspension culture adaptation relative to mammalian cells make them ideal candidates for incorporation into cultured meat and other innovative food products (see Figure 3). Figure 2. Simplified schematic of embryonic and adult muscle development in D. melanogaster as detailed in Gunage et al. (2017) (License: CC BY 4.0). The adult muscle development is specific for dorsal longitudinal indirect flight muscle. Figure 3. Hypothetical production scenario for insect-based cultured meat. Although current insect cell culture and biomanufacturing technologies provide a strong foundation for insect cell-based food production, further innovation is necessary to bring this concept to fruition. First, advancements in 3D culture and scaffolding materials are necessary to allow for incorporation of insect cells into large, complex tissues and to mimic the textures of traditional meat and other food products. Second, effective controls of insect muscle cell differentiation are needed. Production at scale will require proliferating high densities of cells and subsequently triggering differentiation into the desired cell types (e.g., muscle, fat) at precise time points. Further research is also needed on the bioavailability of nutrients in relevant cell types, to further elucidate the health impacts of insect cell consumption. Independent of technology, consumer acceptance may be a barrier to the adoption of insect cell-based foods and other products generated through cellular agriculture. Wilks and Phillips (2017) surveyed consumer attitudes toward the possibility of consuming cultured meat and found that although most respondents were open to trying the products, few showed a willingness to adopt them as a replacement for traditional animal-based meat. For foods that incorporate cultured insect cells, the barriers to consumer acceptance may be even greater. Particularly in Western countries, the concept of insect-derived foods is unfamiliar and potentially unappealing to most consumers. It will thus be beneficial in the early stages of this technology to incorporate cultured insect cells into existing foods and attempt to mimic familiar tastes and textures to highlight benefits without sparking aversion. Eventually, the application of insect cell culture may allow for generation of entirely new food products that expand the frontiers of taste and nutrition. In all cases, successful release and adoption of food products generated through insect cell culture will require a tactful approach to public relations and marketing to ensure consumer comfort and receptivity. As additional research is conducted on invertebrate cellular agriculture, new findings can be explored for applications to other projects within the cellular agriculture space. For instance, further elucidation of the mechanisms through which insect cells retain function in variable environmental conditions could be translated to improve bovine and porcine cells for large-scale culture. A clearer understanding of the adaptability of insect cells to serum free media and suspension culture could similarly be applied to advance technology for other cell types. Actively pursuing these connections between disciplines will not only benefit specific product development efforts, it will also strengthen the field of cellular agriculture as a whole. NR and KF wrote the review. DK and BT provided input on the review and modifications. This study was funded by the New Harvest Cultured Tissue Fellowship and National Science Foundation (IOS-1557672). We thank the National Science Foundation and New Harvest, Inc. for support. Akiyama, Y., Iwabuchi, K., Furukawa, Y., and Morishima, K. (2008c). “Fabrication and evaluation of temperature-tolerant bioactuator driven by insect heart cells,” in Proceedings of International Conference on Miniaturized Systems in Chemistry and Life Science (San Diego, CA), 1669–1671. Bernstein, S. I., Fyrberg, E. A., and Donady, J. J. (1978). Isolation and partial characterization of Drosophila myoblasts from primary cultures of embryonic cells. J. Cell Biol. 78, 856–865. Ceccarini, C., and Eagle, H. (1971). pH as a determinant of cellular growth and contact inhibition. Proc. Natl. Acad. Sci. U.S.A. 68, 229–233. Claydon, K. (2009). Advances in Crustacean Cell Culture. Ph.D. Thesis, James Cook University. Daniells, S. (2018). Chinova Bioworks Self-Affirms GRAS for Natural Chitosan Preservative. Food Navigator USA. Food and Agriculture Organization/World Health Organization (2004). Vitamin and Mineral Requirements in Human Nutrition. Bangkok. Gerber, P. J., Steinfeld, H., Henderson, B., Mottet, A., Opio, C., Dijkman, J., et al. (2013). Tackling Climate Change Through Livestock: A Global Assessment of Emissions and Mitigation Opportunities. Food and Agriculture Organization. Goldschmidt, R., and Wilhelm, K. (1915). Some experiments on spermatogenesis in vitro. Proc. Natl. Acad. Sci. U.S.A. 1, 220–222. Institute of Medicine (2005). Dietary Reference Intakes for Energy, Carbohydrate, Fiber, Fat, Fatty Acids, Cholesterol, Protein, and Amino Acids. Washington, DC. Intergovernmental Panel on Climate Change (2018). Global Warming of 1.5°C. An IPCC Special Report on the impacts of global warming of 1.5°C above pre-industrial levels and related global greenhouse gas emission pathways, in the context of strengthening the global response to the threat of climate change. Maznah, I. (1999). The use of Caco-2 cells as an in vitro method to study bioavailability of iron. Malays. J. Nutr. 5, 31–45. Mekonnen, M., and Hoekstra, A. Y. (2011). National Water Footprint Accounts: The Green, Blue and Grey Water Footprint of Production and Consumption. Delft. Mitsuhashi, J. (1984). Isolation of a continuous cell line from larval fat bodies of an arctiid moth, Spilarctia seriatopunctata (Insecta, Lepidoptera, Arctiidae). Zoolog. Sci. 1, 415–419. Mitsuhashi, J., and Goodwin, R. H. (2018). Invertebrate Cell System Applications. The Serum-Free Culture of Insect Cells In Vitro, ed J. Mitsuhashi (Boca Raton, FL: CRC Press), 31–43. Nutrient Data Laboratory (2018). Food Composition Databases. Washington, DC. Ozturk, S. S., and Palsson, B. O. (1991). Effect of medium osmolarity on hybridoma growth, metabolism, and antibody production. Biotechnol. Bioeng. 37, 989–993. Plant Based Foods Association (2018). Nielsen Retail Sales Data for Plant Based Foods. Toullec, J. Y. (1999). Crustacean primary cell culture: a technical approach. Methods Cell Sci. 21, 193–198. Truman, J. W., Talbot, W. S., Fahrbach, S. E., and Hogness, D. S. (1994). Ecdysone receptor expression in the CNS correlates with stage-specific responses to ecdysteroids during Drosophila and Manduca development. Development 120, 219–234. van Huis, A., Van Itterbeeck, J., Klunder, H., Mertens, E., Halloran, A., Muir, G., et al. (2013). Edible Insects - Future Prospects for Food and Feed Security. Rome. Waymouth, C. (1970). Osmolality of mammalian blood and of media for culture of mammalian cells. In Vitro 6, 109–127. Copyright © 2019 Rubio, Fish, Trimmer and Kaplan. This is an open-access article distributed under the terms of the Creative Commons Attribution License (CC BY). The use, distribution or reproduction in other forums is permitted, provided the original author(s) and the copyright owner(s) are credited and that the original publication in this journal is cited, in accordance with accepted academic practice. No use, distribution or reproduction is permitted which does not comply with these terms.